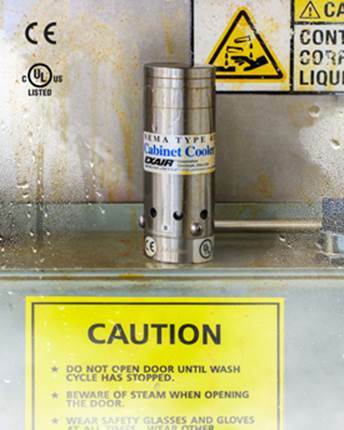 EXAIR’s new Small 316 Stainless Steel Cabinet Cooler Systems keep electrical enclosures cool with 20 degrees F (negative 7 degrees C) air while resisting heat and corrosion that could adversely affect the internal components. The wear, corrosion and oxidation resistance of Type 316 stainless steel assures long life and maintenance free operation. Cooling capacities up to 550 Btu/hr. are ideal for small electrical enclosures and heat loads. Models with higher cooling capacities up to 5600 Btu/hr. for NEMA 12, 4 and 4X enclosures are also available. EXAIR Cabinet Coolers circulate 20 degrees F (negative 7 degrees C) air throughout the enclosure to prevent high temperature malfunctions. They mount through a standard electrical knockout while maintaining the NEMA 12, 4 or 4X rating of the enclosure. Cabinet Cooler Systems include an automatic drain filter separator to ensure no moisture passes to the inside of the electrical enclosure. An optional thermostat control minimizes compressed air use and keeps the enclosure at plus or minus 2 degrees F of the temperature setting. A side mount kit is available when space restrictions prevent mounting on the cabinet top.